The Delhi High Court on Wednesday directed the police to take action against the culprits behind the violence at Ramjas College here in February. Justice Ashutosh Kumar issued notice to the Delhi government and the police seeking a status report regarding the investigation carried out so far in the matter. "You (police) must do something. If you know the culprits, you must take action. Law has to take its own course," the court said while listing the matter for further hearing on September 11. The order came on a plea by three Ramjas College students seeking setting up of a special investigation team (SIT) of independent officers to probe the incident of violence which took place on February 21 this year. The petition has demanded constitution of an independent SIT claiming that the police have not taken any action against the culprits behind the incident despite availability of photographs and video clippings identifying them. Senior advocate Colin Gonsalves, appearing for the petitioners, argued that only an FIR with regard to a scuffle has been lodged and that there has been no progress with regard to the investigation. The petition has also sought a direction to the colleges where the "culprit" students are enrolled to suspend or rusticate them. It has also sought action against the police personnel on duty at the time of the incident for allegedly not taking any preventive action. The plea also asked for a direction to the Delhi government to pay Rs.5 lakh to each of the assault victims. Advocate Rahul Mehra, appearing for Delhi Police, countered the submissions of Gonsalves saying that the investigation was proceeding along the right lines and all efforts were being made to identify and trace the culprits. He also said that the four police officers who were on duty at the place of the incident have been suspended. The court noted his submission that a panel of senior police officers has been set up to look into the matter and the investigation has already been transferred to the Crime Branch. 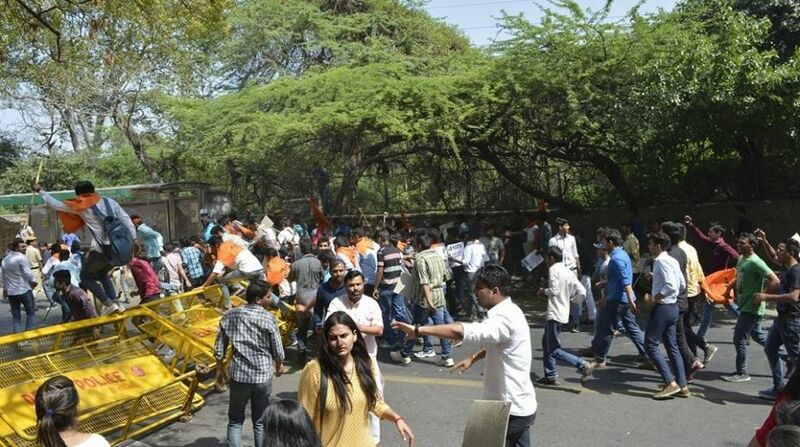 Delhi university's Ramjas College had witnessed large- scale violence allegedly involving members of the Left- affiliated All India Students Association (AISA) and the student body of the RSS, Akhil Bharatiya Vidyarthi Parishad (ABVP). Earlier, a law student had moved a PIL seeking action against the police personnel who had allegedly assaulted students and scribes during the incident. The petition was disposed of after the police had told the court that a panel of senior officers has been set up after the National Human Rights Commission (NHRC) sought the police response regarding the alleged assault on a complaint filed before it. The PIL had also sought lodging of an FIR under various sections of the IPC, including assaulting a woman with an intent to outrage her modesty, action against the police personnel and others who allegedly harassed and assaulted women students and journalists during the protest.